Around Mom's Kitchen Table: Why Would Anyone Want Orange Kitchen Appliances and Accessories? Why Would Anyone Want Orange Kitchen Appliances and Accessories? 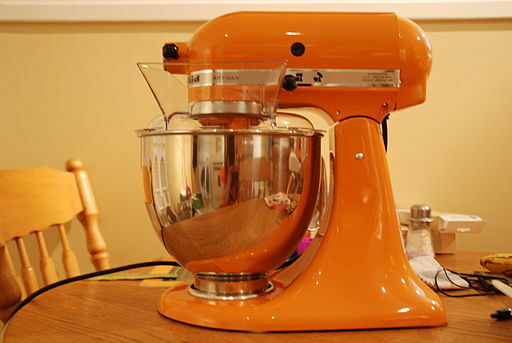 Some people just really like the vibrancy of orange kitchen appliances and accessories, such as this electric kettle. As a mixture of the colors yellow and red, it provides warmth, emotional stimulation, goodwill and friendship. People who like the color orange enjoy the fall when the leaves on the trees are changing. Of course, it could just be because they are fans of University of Texas or University of Tennessee football teams. Or maybe Halloween is their favorite holiday. Whatever the reason, there are many orange kitchen appliances and kitchen accessories to spruce up the orange lover's kitchen. Orange may be called orange, persimmon, tangerine, cantaloupe, or Mandarin orange. Most of the time, these colors are very close to the same, but you still should take care in combining the colors, as there may be minor differences. Orange stimulates the senses, increases appetite, and promotes socialization. Not as vibrant and fiery as its cousin red, orange is a color that most people have strong emotions about. Basically, they either love it or hate it. Very few people are ambivalent about orange.